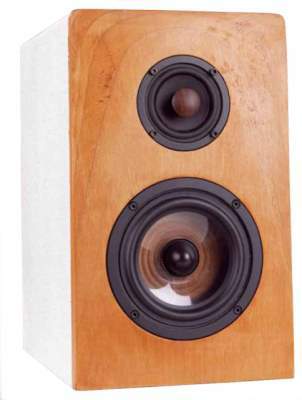 Legno is a compact loudspeaker with Monacor SPX-32M full range driver, complemented by an SPH-5TB woofer. Therefore, this loudspeaker belongs to the group of FAST designs (Full Range and Subwoofer Technology). ... " The Legno surprises with a tight and well structured bass. Not bone dry, but a deep bass is definitely present. And the sealed cabinet certainly has some advantage as the Legno shows: in comparison with most bass reflex designs the bass has more colour, is better outlined and more flexible. Using similar material for different drivers is also a good idea: the transition between the two drivers is practically inaudible. The Legno is no nitpicker intent on the details, it's rather a speaker that wants produce atmosphere and enjoyment: the Legno doesn't irritate and is always in control and relaxed. Imaging is definitely a strong point: The Legno's ability to detach the sound from the physical speaker and to reproduce virtual sound sources almost anywhere in the room is exceptional, even when the speakers a far apart from one another - this is impressive. This works even better when the full range drivers are operated with the rear open. Slightly angled towards the centre and the full range driver produces silky and relaxed high frequencies; here as well, there is no need to niggle."